This is our most popular crib! You won't find a safer, full size folding rental crib than this. Metal surfaces can better be disinfected. We have answered your requests and an upgraded 5" coil spring mattress is included. No tools needed. Meets the latest CPSC safety standards 16 CFR 1219 put into effect 12/28/12. 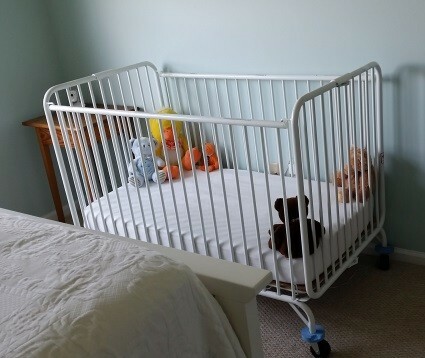 By request we now have available this metal crib with a 5" coil spring mattress. The mattress meets or exceeds all flammability and lead testing and does not contain toxic fire retardants. Crib sheets are available, or bring your own. No tools needed, just fold open and put the board and mattress in the crib. CPSC and ASTM certified.